Col. Flagg threatens Klinger’s defense! The copy of this episode floating around is missing roughly five minutes, making it hard to follow the storylines. Watching it wasn’t nearly as difficult as watching the Season 1 episode “By the Book” dubbed in a foreign language. AfterMASH expert David Goehner was kind enough to dig out his script for “Trials” and fill in the gaps for me. It’s a real shame this episode isn’t available for M*A*S*H fans to watch in its entirety. Not only does it contain multiple references to M*A*S*H but it sees the return of Colonel Flagg. Colonel Flagg testifies against Klinger. There are two storylines: Klinger on trial and Dr. Boyer feuding with Wally Wainright while trying to save a patient’s leg. Both are solid and enjoyable, even with five minutes missing from the episode. Dr. Boyer’s storyline does feel like an afterthought, thrown in by the writers to break up the courtroom scenes, but at least it’s interesting and we get to see Boyer throw a fruit basket through a window. The opening scene, which is missing from the episode, sets the stakes for Klinger. Soon-Lee tells him she’ll take their baby and go back to Korea to stay with her parents if he goes to prison, only returning when he’s released. Most of the characters are at the courtroom for Klinger’s trial. Potter takes the stand first, followed by Father Mulcahy, then the vagrant who shared a jail cell with Klinger, Bob Scannell, and finally Mildred Potter. The prosecution calls one more witness: Colonel Flagg. Everyone is shocked to see him. My favorite line of the episode is probably Flagg giving the judge hints about which intelligence agency he works for: “Its got initials and we’re allowed to carry firearms in our shoes.” Why does Flagg testify? 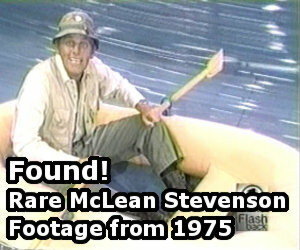 He’s been in River Bend investigating Klinger, who he thinks is either a Communist sympathizer or an actual Communist. As proof, he offers the fact that Klinger married a Korean bride who has relatives in North Korea and stayed in Korea for two months after being discharged from the U.S. Army. Klinger takes the stand to defend himself and winds up arguing with Flagg. I would’ve preferred seeing fewer characters take the stand, perhaps just Potter and Father Mulcahy, then Flagg and finally Klinger. The vagrant, Bob Scannell, and Mildred Potter don’t offer much in the way of testimony. Klinger and Flagg nearly come to blows. Despite Flagg’s best efforts, the judge is sympathetic. He tells Klinger’s lawyer to change his plea to not guilty by reason of insanity. Klinger will be committed to the psychiatric unit at General Pershing Hospital to undergo a thorough evaluation. My second favorite line of the episode comes is Potter’s reaction to the judge’s decision: “Well, Klinger, it looks like you’re finally going to get that Section 8. Klinger realizes he has to play along and tells Soon-Lee not to worry. He’ll pretend to be nuts for a few months, then suddenly become sane again and go free. Soon-Lee is worried but agrees to stay in the United States. Everyone leaves except Colonel Flagg, who continues ranting to the empty courtroom. 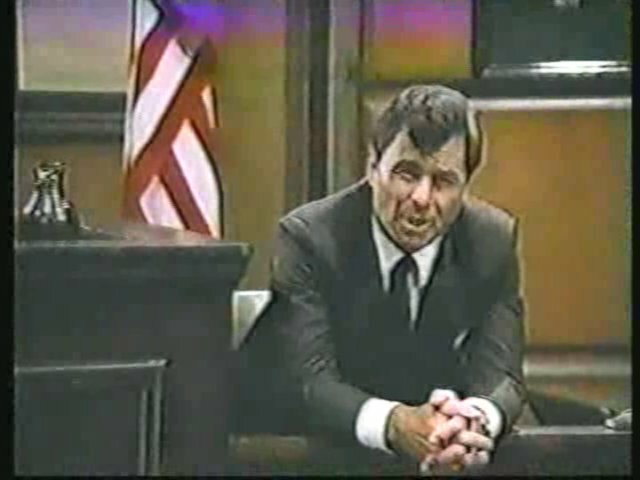 As I mentioned earlier, Dr. Boyer’s secondary storyline feels unnecessary but isn’t boring and it does help keep the courtroom scenes from dragging. Unlike Mike D’Angelo, Wally Wainright is no pushover. Dr. Boyer can’t frighten him as easily. Despite a successful surgery, Boyer and Wainright wind up threatening one another. Boyer goes as far as to threaten to kill Wainright if he ever puts the hospital ahead of one of Boyer’s patients again. Yikes. I like everything about this episode except the way it ends. Seeing Colonel Flagg again is a lot of fun. Flagg is at his best when his wild theories sound almost rational and his paranoia is evident but not overwhelming. 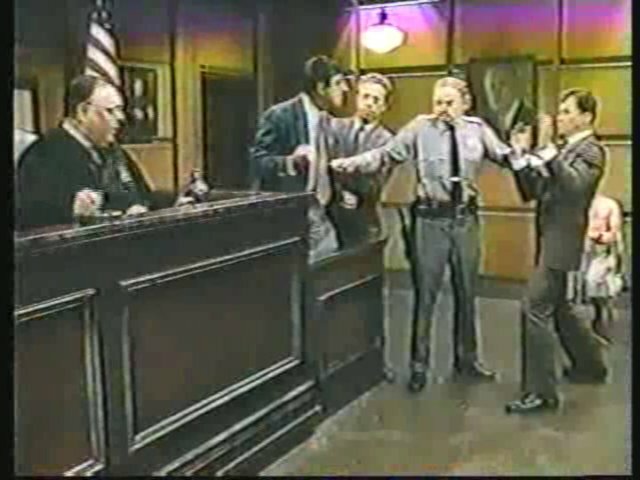 It’s unfortunate the episode ends with Flagg raving first to the judge and then to the empty courtroom. It makes him seem pathetic. It’s not funny. It’s a disappointing finish to such a strong episode. Hopefully, AfterMASH will eventually be released on DVD so M*A*S*H fans can watch this episode. If anyone has a complete copy on VHS, please let me know. A new set of opening credits, featuring live action sequences rather than color sketches, debut with this episode. There are more references to M*A*S*H in “Trials” than any other episode of AfterMASH. And there were supposed to be more. A line in the script has Klinger mention Colonel Blake. It’s too bad the line was either not filmed or cut from the episode before airing. While on the stand, Klinger tells the judge, “I lifted my skirt at Sygmun Rhee,” something I don’t remember hearing about on M*A*S*H.
When he enters the courtroom, Colonel Flagg asks the bailiff, “If I jumped out that window where would I land?” In the M*A*S*H episode “The Abduction of Margaret Houlihan” during Season 5, Flagg jumped out of a window in Potter’s office and broke his leg. There’s yet another potential reference to M*A*S*H. During surgery, Dr. Boyer mentions seeing “one of these transplants in Tokyo during the war.” David Goehner wonders if Boyer attended the same conference Hawkeye and Trapper did in “The Consultant” and learned about arterial grafts from Dr. Borelli. This is the first of two episodes directed by Charles S. Dubin, who directed 44 episodes of M*A*S*H between 1976 and 1983, more than any other director. This is the 11th of 13 episodes written or co-written by Ken Levine and David Isaacs. Guest star Kenneth White previously appeared in the M*A*S*H episode “Potter’s Retirement” during Season 6. Guest star Natasha Bauman (who also appeared in “Staph Inspection” during Season 1), previously appeared in two episodes of M*A*S*H during Season 11. What was the line that was cut of Klinger mentioning Col. Blake? So, we not only missed out on getting Col. Blake’s name mentioned in the sequel series, we also missed learning the answer to the “M*A*S*H” trivia question of how many times Klinger applied for a Section 8! I’ll probably post a little more detail on Monday on what’s missing in the various YouTube skips that occur in this episode. It’s helpful to know what’s missing when you try to watch the only version that’s on the Internet. Maybe I’ll also bring up a few of the other fully deleted lines that were in the script. Awesome, thanks. I was just about to ask what the Blake line was as well. Love hearing about Blake, Trapper, Frank, and Radar after each of them left. Brings continuity, but more importantly to me, shows the characters still think about them. Thanks for responding. I know Alan Arbus wasn’t in the episode but did anyone bring up Sidney Freemen in connection with Klinger’s sanity? Col. Flagg is my favorite M*A*S*H character (being the most satirical), and when I finally got to see this episode (again) not too long ago on YouTube, even I thought they went too over-the-top with him at the end. Still, I loved the reference to Joseph McCarthy stealing Flagg’s thunder. It makes me think it’s possible it was meant to mirror the end of the Army-McCarthy hearings when the senator is ranting on and on while everyone else is filing out, largely ignoring him (even laughing at him), and he finally ends meekly with, “I’ve got to go vote now” (more or less those words). Wait . . . Klinger was only in Korea for two months? You sure it wasn’t two years? Stayed in Korea two months after GFA to find Soon-Lees parents. Obviously way more than two month’s total though heh. He was there since the early days of Blake until the end. I’d say closer to 3 years total. Oops. Misread that. I thought two months seemed like a ridiculously and unrealisitically short amount of time for Klinger to spend running around in dresses in Korea. – The opening scene is completely missing, and is as RJ describes it in his overview above. Soon-Lee also mentions that she didn’t bring the baby because she didn’t want the newborn to see his father in jail. – The next scene is almost entirely missing, and you see some literal slivers of it on YouTube: Alma reminds Boyer that he’s interim chief of staff in Potter’s absence that day, and says she won’t let Boyer shirk from his responsibilities. She wants him to come to her office to prepare for the day. Boyer fends her off by saying: “Okay, Red, I love it when you treat me like a child. Of course, I’ll come with you. But why you’re office? Why not the O.R. ?” (And, as he pushes her to the wall…) “We could scrub each other, put on masks, and conduct an exploratory neither of us will soon forget.” Alma tells Boyer he’s disgusting and that she’ll handle thing herself until Potter hopefully returns tomorrow. – The start of the 3rd scene is missing: Boyer looks at the sleeping patient Graham in the ward and sees that the pain in his calf and his circulation is getting worse. Boyer tells Wainwright that Graham needs to have a blood vessel cleaned out an grafted or he’s going to lose the leg. – At the trial, after Flagg talks about “firearms in our shoes”, there’s a skip where Mulcahy says, ‘I thought after the war, fellas like him would be selling used cars.” Potter responds: “Who said the war was over?” The judge resumes: “What brings you to River Bend?” Flagg responds: “I have been looking in the activities of one Maxwell Q. Klinger … the man sitting at the guilty table.” YouTube picks up with the “communist sympathizer” line. – After the O.R. scene, what’s missing from the start of the next trial scene when Klinger is on the stand is the judge saying: “Mr. Klinger, I just want to remind you that you are not obligated to testify on your own behalf.” Klinger says: “A lot of my good friends have spoken on my behalf. I want the chance to refute them.” Klinger’s attorney, Miller, says: “In your own words, tell us how you came to be here.” Then the YouTube scene starts up. – The scene in the changing room after the surgery starts with Boyer telling a nurse to check Graham’s pulse every 5 minutes. Another nurse, Parker, is washing. Boyer says: “Are you as pumped up as I am right now?” Parker says: “Uh-huh.” Boyer: “What should we do about it?” Parker: “We could go dancing.” Then YouTube picks up the scene. – When Wainwright is at his desk, what you don’t see very well on YouTube is that he’s looking at a V.A. chain of command chart. – The next trial scene is missing its start: The judge is talking to both couples, and says Klinger is clearly guilty, but the judge feels there seems to be “extenuating circumstances … hundreds. This Klinger has been through quite a bit during the war.” Then the YouTube version picks it up. – In the final skip, after the verdict, he miss hearing the bailiff tell Klinger: “Come on, Max, let’s go.” Then Klinger says: “Soon-Lee, please, you can’t go. 2, 3 months, and we’ll all be together again. Whaddaya say?” Soon-Lee: “Well, -I- think you’re crazy. Why shouldn’t they?” Klinger: “Thanks, honey. I love you, too.” Then YouTube picks tip the rest of this concluding scene.